Background: Patents reveal that mobile phones are the best possible mode of contact in case of any emergency situation. However, a message such as switched off or out of coverage area on mobile phones may make a caller helpless. There is no way of contacting a mobile user if the user is in a situation of out of range or switched off state due to non-coverage or any technical fault. 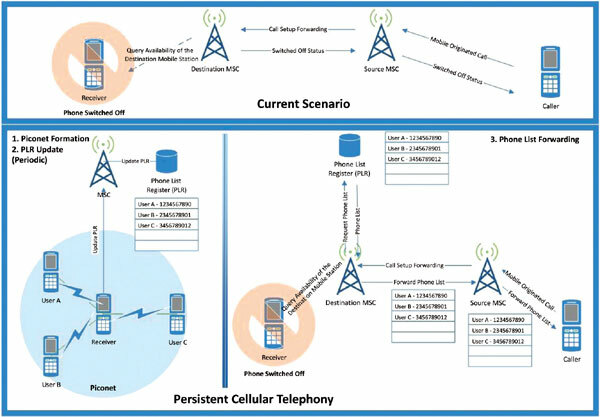 Objective: This paper proposes a method using existing GSM architecture which allows to contact the cellphone users even if their mobile is switched off or out of coverage area. Methods: The proposed solutiongathers the information of all the mobile phones present in the vicinity of a particular mobile phoneover a Bluetooth connection.This information is stored and maintained at the network subsystem in a database called Phone List Register (PLR) which is updated periodically. Whenever a user needs to contact a mobile which may be either switched off or out of coverage area the service provider shall make this list available to the user so as to contact the intended receiver. Results: The proposed method has been analysed to be a viable solution for providing messages to a particular person, or even identifying the last known location of the user in emergency scenarios such as terrorist attacks, kidnapping and other disaster situations. Conclusion: The implementation of PCT in GSM network will open a wide range of facilities for a user that will make mobile communication more persistent and easy to use. Cellular telephony, phone list register, piconet, GSM architecture, vicinity, communication.